I’m not big on animations. Mostly because I believe most users don’t care, but also because I think they are over-used (which is no surprise given the micro interactions trend). Of course, that is not to say they are irrelevant. I’m a fan. Just not a big one. So in that regard, I’ve always appreciated the simple Divi options available, which are basically fade, slide, or none. However, sometimes you do want more or, at least, different animations and in spite of my aforementioned opinion I have a crush on animate.css. I have used it a few times on a few sites, but always on modules in the initial viewport (like getting the logo to bounce on this site build) because I have not been able to get animation to occur on scroll. So applying animate.css classes like ‘bounceIn’ to a blurb module down the page will cause that module to animate on page load…way down below where the user doesn’t sees it. And when they scroll down, they do not see the animation (because it already occurred). And then I came across wow.js by Matt Aussaguel, which has the title “Reveal Animations When Scrolling.” Yup, that sounds right. From what I can tell in their licensing agreement, you will need to purchase it to use it in the wild, but this blog example fits under their free license so let’s get it going! If those sound like something you want, then it’s surprisingly easy to do. Click on this super clear “how to install wow.js and animate.css in wordpress” link by Jeremy Cookson. 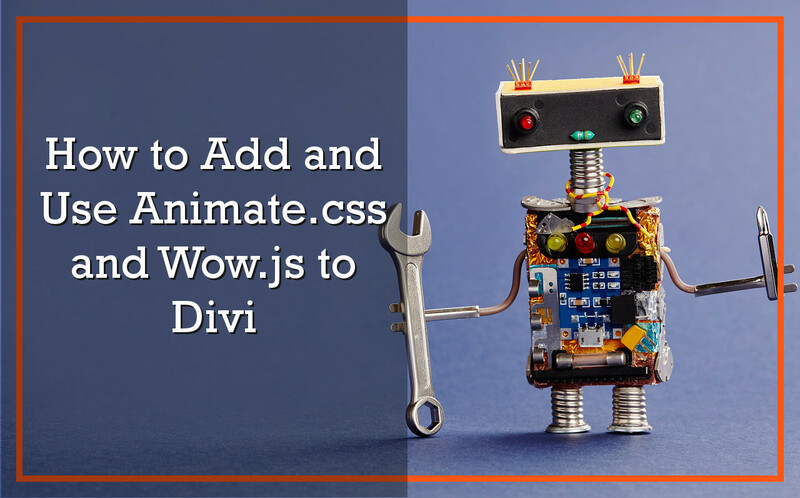 Add the relative animate.css name to any module. And there you go! From them on you can apply the class ‘wow’ to get the scroll function and then any animate.css class to get the effect. I have read with enthusiasm this post and everything is reproduced and it does not work. I know you have no glass ball, but maybe you know the mistakes that are made in the implementation and have a tip for me. I have it with the “short version” LOL also checked, would be nice if you could help me. What is the site URL? I’ll take a peek at the front end and see if anything stands out. Some basics to double-triple check are file paths and functions.php modifications. Great article, but I seem to be having the same issue with the getting this to work with Divi as Bernd S.. I have followed the article and verified all content is in the correct location. I am using a child theme with the latest version of Divi Theme. One thing I have not been able to find is a way to turn off animation. Everything else is just as your article and video. I am testing this on a demo site at http://labpages.hlehosting.us. If you could take a look at the site and see what may be happening I would greatly appreciate you help!! I tried everything, but this doesn’t seem to work for me. You can go to the website I linked and check if it works on your side but it doesn’t work for me for the pictures or anything else. You have some errors on the site (Chrome –> Dev Tools –> Console). Fix those and then see what happens, Amigo.